The Victory Belles, honoring military veterans and their families. U.S. military veterans and their families were honored during a New Albany Freedom celebration entertainment event Friday evening at the First United Methodist Church. 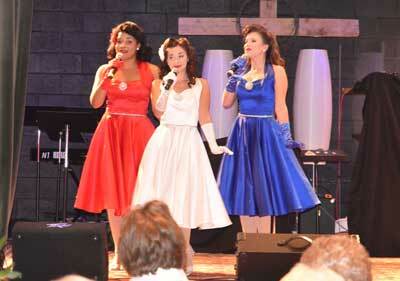 The Victory Belles in their performance June 29th, at the First United Methodist Church. The Victory Belles, a female singing trio representing the National World War II Museum in New Orleans, were the featured entertainment. Wearing 1940s hairstyles, dress styles and makeup, the Victory Belles sang music made famous by the big bands of that era. The appearance and sound of the Victory Belles is reminiscent of that of the Andrews Sisters. An audience of about 85 people enjoyed their musical act, which opened with a vocal version of “In the Mood,” the 1940s hit by the Glenn Miller Orchestra. There is much more music, as well as other entertainment still to come at 2018 Freedom Fest on Saturday. A day of family fun kicks off at 8AM. Musical entertainment will begin in Park Along the River at 6:00 PM, and will run until about 9:30 PM. The Bonfire Orchestra, a folk-rock group from Tupelo, will kick off the evening’s concert, followed by the popular Paul Tate Trio’s jazz at about 7:15PM. 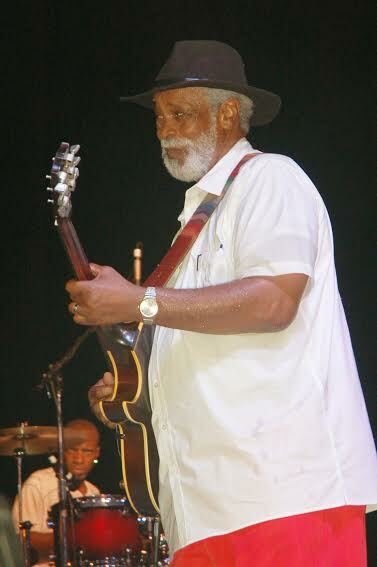 New Albany’s own Grammy winner, Sam Mosley, along with the Muscle Shoals Horns, will take the stage at about 8:30 PM for a round of blues. Grab a chair and come on down to the bank of the Tallahatchie. 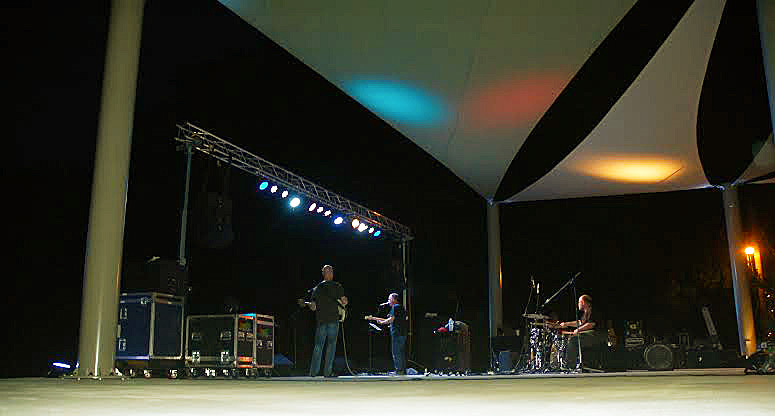 The Paul Tate Trio were the first musicians to play under the sails on the new Riverview Stage. A fireworks display will close out the 2018 Freedom Fest immediately after Sam Mosley and the Muscle Shoals Horns wrap up their performance on the Riverview Stage.